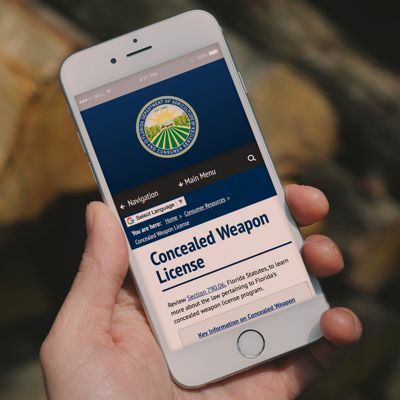 The concealed weapon license application will be completed at a computer station and the applicant will be photographed and electronically fingerprinted. The process takes less than an hour and prescreening decreases the likelihood of the application being delayed due to errors or omissions. An applicant’s eligibility for licensure will be made by the Florida Department of Agriculture and Consumer Services. Florida Concealed Weapon Permits are valid for seven years. The expiration date appears on the front of your license. Approximately 150 days prior to the expiration date of your license, the Florida Department of Agriculture and Consumer Services will send you the renewal notice. Bring all of the required information to submit your renewal package in person using our fast-track process. All of this information may be found on your Concealed Weapon License and your renewal notice. Legal name change documentation if applicable i.e. marriage certificate, court records, etc. If you fail to renew your Concealed Weapon License by its expiration date, it can be renewed up to six (6) months beyond the expiration date, in accordance with section 790.06(11)(a), Florida Statutes. However, there is a late fee of $15 for renewing after the expiration date. A Concealed Weapon License that has been expired for longer than six months cannot be renewed. If you fail to renew within that six-month period after expiration, you will have to apply for a new license. You cannot carry a concealed weapon or firearm after your license has expired. Make an appointment. Please note that appointments are not required, but are preferred for faster service. IMPORTANT ANNOUNCEMENT: Effective July 1, 2017, concealed weapon licensing fees were reduced.